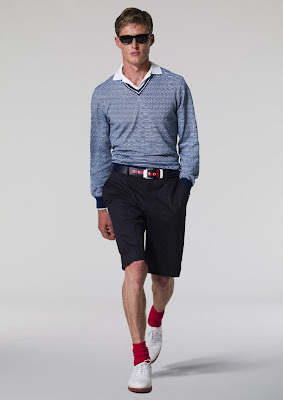 Let's hear it for the boys, with the latest from British label Hackett! 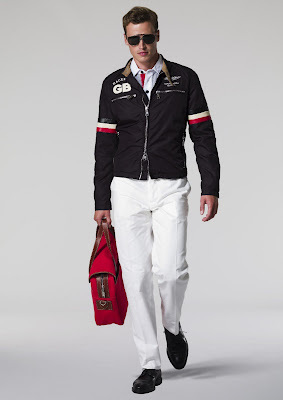 This S/S 2010, Hackett reinforces its links with iconic British sporting events and institutions through 4 different themed collections: Mayfair, Island, Into the Blue and Aston Martin Racing. The style and mood of the Mayfair collection this season is governed by color and splits into two sections: ‘Brown in Town’ and ‘London Greys’. 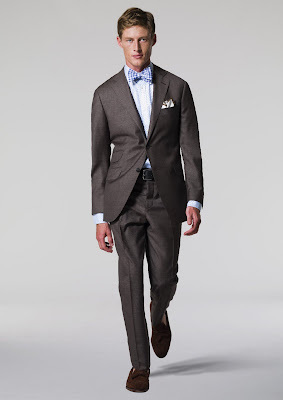 Referring to the unwritten style rule that the color was historically frowned upon in London, ‘Brown in Town’ is Hackett’s up-to-date advice to the contrary. Consisting of soft tailoring, fine cotton shirting and luxurious outerwear, the collection brings the spirit of the seasoned traveler to an urban environment with a brown color palette of cognac and sepia to camel and cream. Suiting is designed for warmer climates in lightweight worsted fabrications, seersucker and cotton-based herringbones and separates in ultra-luxurious blends of wool, silk, linen and cashmere. ‘The new trench’ is cropped and fitted to give old world style a modern twist while the ultra-light packable mac is a sartorial safety-net in uncertain weather conditions. Exquisite attention to detail is evident with tortoise and leather buckles and trims and can be accessorized with fresh linen scarves, tortoise eyewear and the new City Luxx range of luxurious kid leather bags. ‘London Greys’ extracts the best of (sophisticated) sixties London in a palette of navy and cool greys with accents of coral and blue and with refined suiting, shirts and ties as sleek and slim as the men from the era it pays homage to. Island is inspired more by a state of mind than a geographical location. The colorful collection evokes sand-swept terrains and cerulean seascapes that one could associate with any number of ‘escape’ destinations. In a variety of bright colors, garments are treated using a newly-developed formula creating a look that indicates the natural bleaching effects of salt and sand. Natural fabrics play a key role in this story with garment dyed linens and cottons printed with floral patterns and motifs. Swimwear gets sleeker and more streamlined reflecting the 1950s style shorts with a shorter, more fitted leg to streamline the body. Into the Blue takes the story from day to evening with a sophisticated palette of French navy, oceanic blue, deep cobalt, cerulean, and crisp white. Pattern is key with paisley, large ginghams and micro polka-dots featuring on accessories and shirting. Textured white shirts are fitted with Eton collars. Shirts now have a slim button-down collar and a cropped body length to finish above the hip. Lightweight pima cotton polos are also more tailored with minimal branding resulting in a more formal take on classic casual ranges. The sleek lines and dynamic style of Aston Martin Racing continues to provide the inspiration for Hackett’s technically advanced range and this (its eighth) season holds particular significance for the British automotive brand. 2009 marked fifty years since Aston Martin last won the world famous 24 Hour Le Mans outright and in an almost celebratory manner, managed to secure the Le Mans Series Trophy win once again this season. Hackett takes the style, pageantry and glamour of events such as Le Mans and classic British Grand Prix’ along with cool drivers of this era such as Stirling Moss with thoroughly modern technology as a style starting line and engineer garments that encapsulate motor-sport inspired design in ultra modern materials. Unfeasibly lightweight, seamless garments have been created in a dynamic palette of graphite, magnesium and chrome with searing accents of red. As key sponsors of the Aston Martin Racing team, Hackett drives home their association with racing stripes on bags, jackets a driving helmet and small leather goods all within the spring/summer 2010 range, Aston Martin branding is evident throughout. In the Philippines, HACKETT is exclusively available in Rustan’s Makati.